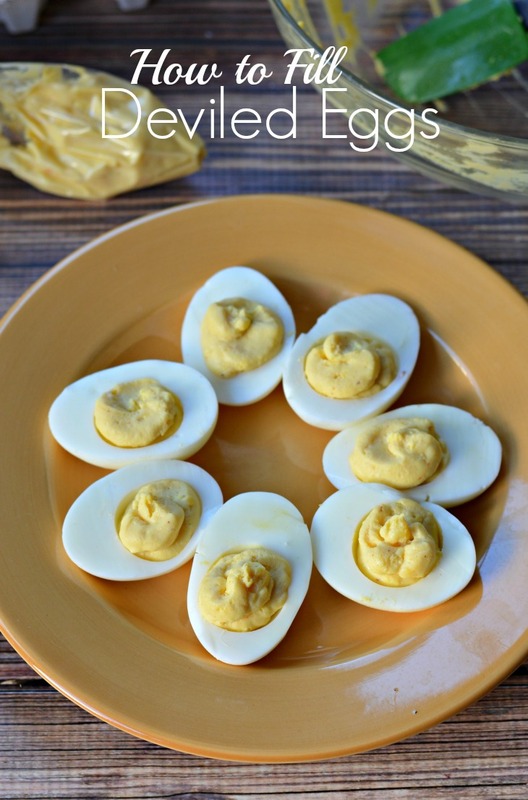 Love deviled eggs but hate the chore of filling them? Check out this easy “kitchen hack” featuring products from our sponsor Fresh & Easy for filling deviled eggs quickly and easily. Deviled eggs are one of my family's favorite foods, but I make them exactly once a year at Easter because they are such a pain to make. It's taken me many years, but I've finally perfected the art of making deviled eggs without killing myself thanks to a fun “kitchen hack.” I've decided that deviled eggs are a great dish to bring to holiday parties, too, and everyone loves them. I love coming home with an empty plate. 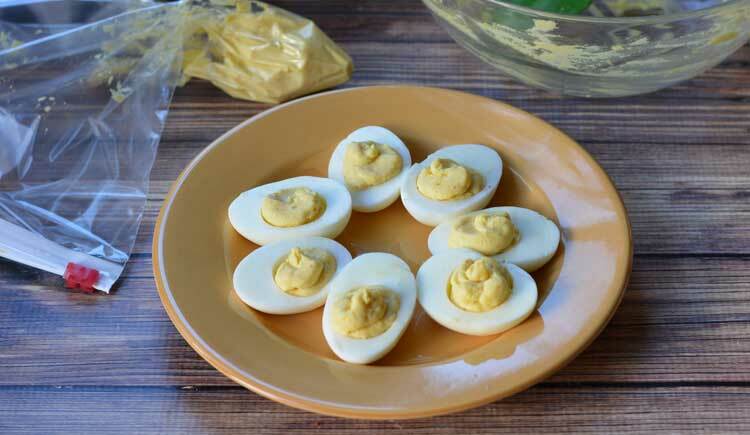 One of the tricks to great deviled eggs are great ingredients. 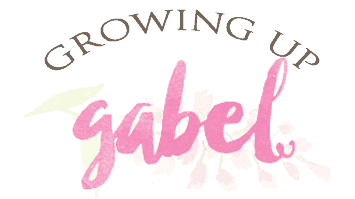 One of my favorite grocery stores is Fresh & Easy because they are smaller in size and carry many fresh organic and natural products. One thing I love about Fresh & Easy brand products is that I know the product is all natural and guaranteed to be free of artificial colors, and flavors. The prices are great, too. I was able to find all Fresh & Easy brand products for deviled eggs. My New Yorker husband insists on using spicy brown mustard and Fresh & Easy is actually one of his favorite brands. I also picked up the Fresh & Easy real mayo (no cheating here!) 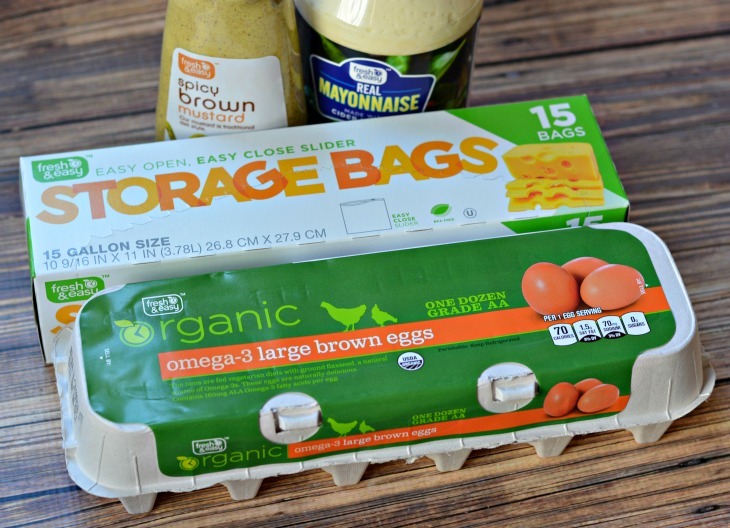 along with organic eggs and my deviled egg kitchen hack – plastic storage bags. The first step in deviled eggs is to hard boil the eggs. Put your eggs in a pot and cover them with 1″ of water. Bring the water to a full boil. Cover and let stand for exactly 10 minutes. While the eggs are cooking, fill a large bowl with cold water and add ice. When your 10 minutes are up, drain the eggs. Crack the shells gently with a spoon and then put them in the ice water. Let them sit in the water for a minute or two then peel. Look at those yolks! Perfect. No grayish tinge. Mix the yolks with mayo and mustard. As I said, we use spicy brown mustard, but whatever you want is fine. I like Dijon, too. I used to try and scoop the yolk mix in to the shells and it was a huge mess and took forever. Then one day it dawned on me to use a Fresh & Easy plastic food storage bag and pipe in the yolks. Put your yolk mixture in the bag and squeeze it down in to a corner. Snip the corner off and gently squeeze the yolk out of the bag in to your egg whites. It takes a matter of seconds to fill all your eggs. You could get fancy about it and try to make them all swirly and pretty but I usually just squeeze it and move on. I love how “kitchen hacks” make life easier! 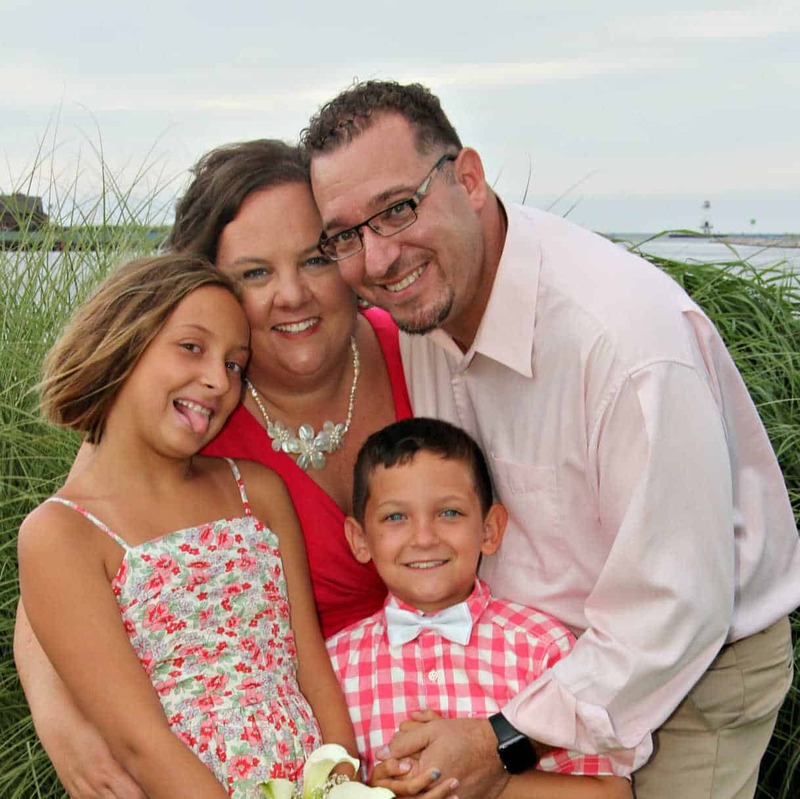 You have to check out Fresh & Easy’s “Hacks of Life” Pinterest board. It’s filled with a TON of genius cooking hacks. It's one of the best boards I've seen on Pinterest! 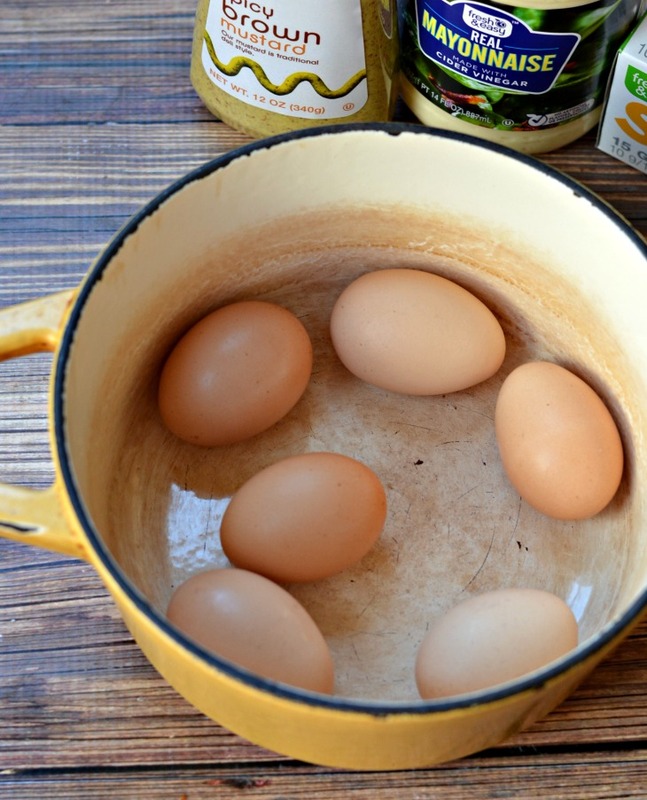 Place eggs in a medium sized pot. Cover with water so the water is 1" above the eggs. Bring the water to a full rolling boil. Place lid on pot, turn off heat and let sit for 10 minutes. While waiting for the eggs to cook, fill a large bowl with cold water and ice. When the 10 minutes are up, drain the eggs. Gently tap the eggs to crack the shells and then place in the ice water. Let sit for a few minutes. Gently peel eggs. 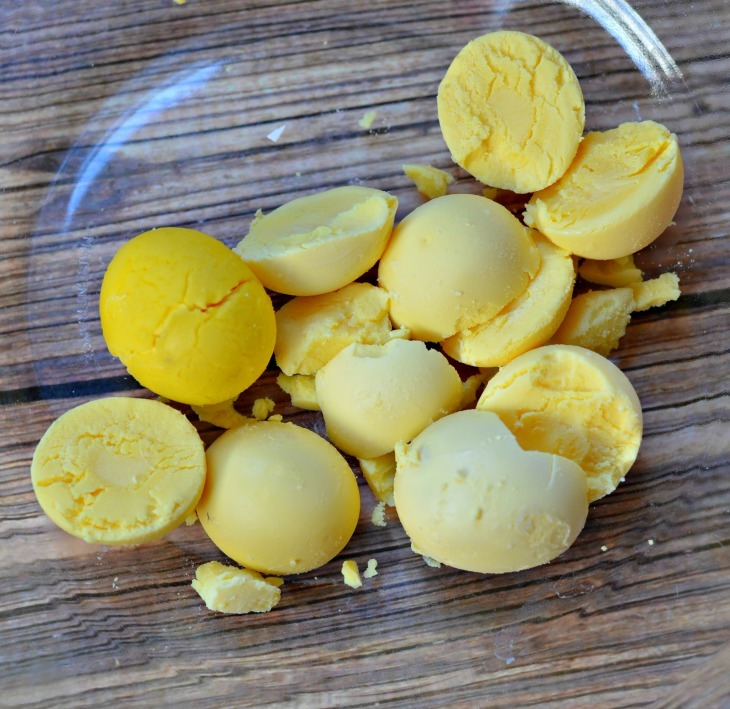 Slice eggs in half and remove yolks. Mix yolks with mayo and mustard. 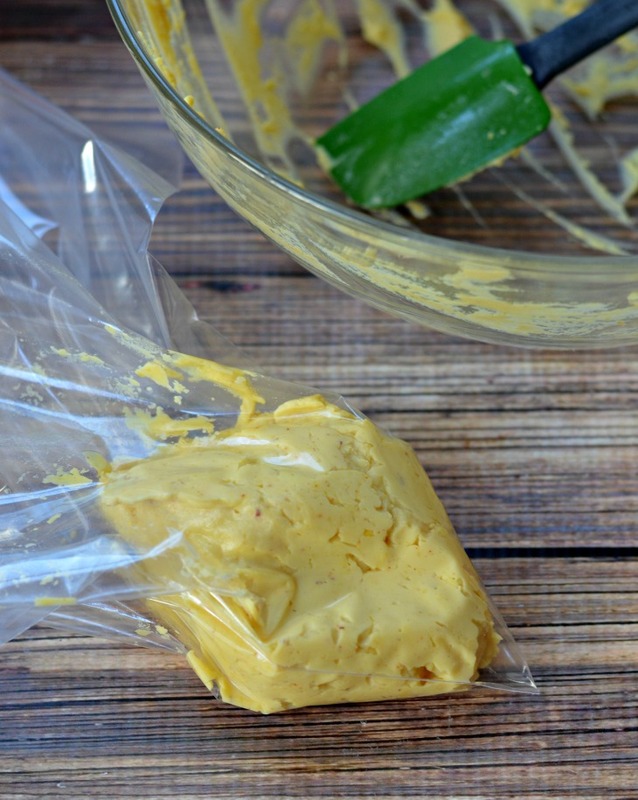 Spoon yolk mixture in to the plastic bag and squeeze it down in to a corner of the bag. Cut the tip off the bag. Gently squeeze yolk mix in to egg halves. Serve immediately or refrigerate until serving. This is a sponsored post written by me on behalf of Fresh & Easy. I have used this method for years, but I put the yolks, mayo and mustard in the bag. Squish and mix well, then clip off a tip and pipe into the egg whites. One dirty bowl eliminated! Cooking is not that time consuming, but the clean up can be a bear! I like anything that makes less dishes.